Perpignan have sacked manager Jacques Delmas after just four months in charge of the Top 14 side. After just ten games into the 2011-12 Top 14 season, club president Paul Goze has decided that the former Biarritz and Stade Francais coach has failed to reach the standards expected and has shown him the door. 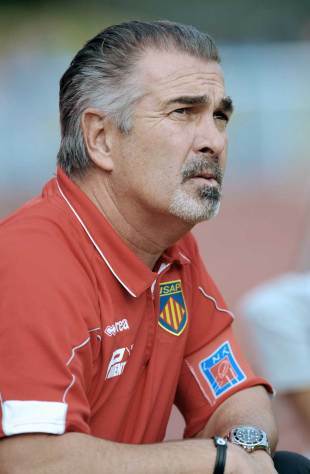 In Delmas' place, the reins have been handed to assistant coaches Bernard Goutta and Christophe Manas. Delmas stepped into the void left by the now Italian coach Jacques Brunel at the start of the current campaign but has overseen the side lose seven matches in their first twelve outings. And with Perpignan languishing in eighth place in the Top 14, Goze deemed Thursday's defeat to Newport as the final straw. "After the latest defeat in Wales without even a losing bonus point, I am forced to recognise that Jacques Delmas's integration into our group as not happened as we had hoped," said Goze "I'm disappointed for the man, for whom I still hold the greatest esteem, but I was obliged to act in the interest of the club. "The difficulty for a manager to arrive alone into a team of staff and a squad already in place have prompted me to not replace Jacques Delmas and I have thus handed over the professional team to Bernard Goutta and Christophe Manas. "I have also asked the whole group not to comment on my decision but to concentrate solely on the preparation for our match on Friday against Stade Français, which is vital for USAP in the race for [European] qualification."